A cursory look at the streets, traffic lights and intersections in Brussels reveals a disturbing phenomenon – a huge rise in the population of beggars. Amid the ever-changing appearances of the city, one feature of commune life remains the same – the daily presence of beggars on the streets. These include youngsters aged between 16 and 18 who are pinning their few hopes on the generosity of caring shoppers and passers-by. Marie-Anne Robberecht, spokesman of Samusocial, the organisation in charge of the coordination of the shelters, promises to provide shelter to all who need it. “We not only provide a roof over their heads, but also hot meals, shower facilities and medical assistance. We also offer psychosocial support to help them find a way of the streets,” she said. Freek Spinnewijn, director of the Brussels-based European Federation of National Organisations Working with the Homeless (FEANTSA), said: “Crisis is an overused term at the EU level and yet what we are currently witnessing is nothing short of a social emergency. But what is it really like for people, living below the breadline, to resort to begging? I took to the streets of Brussels to try to find out. Dressed in cheap clothing, holding a piece of tatty cardboard bearing the plea “J’Ai Faim Et Sans Abri. Aidiz Moi” (“Hungry and homeless. Please Help”) and brandishing a plastic bowl I braved the bitter cold. It wasn ́t long after I had settled down at my chosen ‘pitch’ – near Place du Luxembourg – that the first coins started falling into the container – cash from kind-hearted people I did not know for doing absolutely nothing. But as the cash trickled in, I encountered my first aggressive response – a burly man pointed to my pathetic little sign and ordered me in no uncertain terms what to do with it, telling me to find a job. A short time later my faith in the public’s kindness was restored when an elderly lady bent down, wished me, “Joyeux Noel” and dropped a one-euro coin in my cup. I was too embarrassed to make eye contact. It was touching that an elderly woman, whose threadbare clothes suggested she had little herself, was prepared to come to my aid. Were people giving their hard-earned cash because they felt “guilty” or did they really care? A woman, pushing a young child in a pushchair, stopped and asked if I wanted a baguette she’d just bought. When I declined she dropped a 50-cent coin in the cup. Another passer by urged me to visit one of the homeless shelters recently opened in the city, advising that that was where I could get something to eat and drink. For all the kindness shown to me by some, the majority of people barely turned their heads when they passed. After four more hours in the chill, I counted out the money from my tub. I’d been given the princely sum of €14 euro and 30 cents. It is estimated that at any given time there are at least 150 people, or ‘rough sleepers’, bedding down on Brussels’ streets. Belgium has not escaped the impact of the well-documented migration crisis that has engulfed the EU in the last year-or-so. It is feared that some of the migrants and refugees displaced by the recently closed ‘Jungle’ refugee camp at Calais may have headed to Brussels and are among those begging on the city’s streets. But the problem is closer to home than some might like to admit, as is evidenced by the Flemish parliament’s decision to explore solutions to homelessness among children and young people. This comes after a report from the children’s rights commissioner revealed that one-in-three homeless people in Flanders is a minor. For one-in-three of those, the situation ends up lasting for more than a year. According to the report, 12,958 eviction procedures were started in Flanders in 2014, with children involved in one-in-four cases, most of which concerned rent arrears. The team of children’s rights commissioner Bruno Vanobbergen spoke to 43 families about their situation. Vanobbergen described homeless children as “refugees in their own land”. 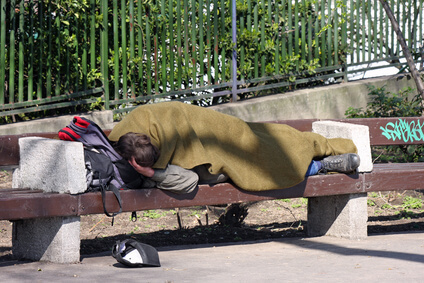 Homelessness leads to lack of privacy, and it often requires one-or-more changes of school, meaning they must leave their friends and give up out-of-school pastimes, he said. The children become uprooted and at the mercy of the adults around them. Vanobbergen’s recommendations include a more preventive approach when it comes to evictions of families with children, a more ambitious approach to the provision of social housing, and the provision of emergency and transitional housing by local authorities. Despite the apparently desperate outlook for the homeless in Belgium this winter, even in these hard-pressed times, there is clearly some goodwill left, as I discovered. After my short stint as a beggar, I was able to change my clothes and regain a semblance of dignity. Sadly, it’s a privilege not enjoyed by the genuine homeless. With an estimated half a million people sleeping rough or in emergency or temporary accommodation every night, the EU can’t afford not to act. NB. Martin donated the money he made that day to charity.